This is a 3 day / 2 night Fraser Island ADVENTURE HIKE (self-walk) with a 4wd transfer from the barge on the west coast to Lake Wabby trail head on the east. Enjoy swimming at Lake Wabby and Lake McKenzie. Hiking is seasonal to winter! 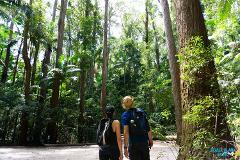 Visit the spectacular Valley of the Giants - where you can explore the two largest trees on the Island - the Giant Satinay and the Giant Tallowwood, walk under the forest giants and see the beauty of the untouched rainforest. Stay where the 4WD's can't and BE THE ONLY PEOPLE to camp at Lake McKenzie! 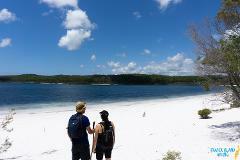 This is an enjoyable 2DAY/ 1NIGHT hike, which lets you experience the true beauty of Fraser Island! Includes all equipment and 4WD transfer to the island. 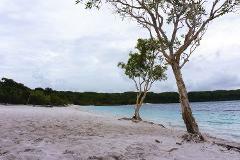 Have a real Fraser Island Eco Adventure and experience five (5) of Fraser Islands most beautiful pristine freshwater lakes on this, 3 day and 2 night, fully supported pack free hike! Be transferred to the starting point of the track by 4wd. Embark upon an amazing, fully supported, 3 day and 2 night hike, where you will experience the best sights on Fraser Island, including: Lake Garawongera, Valley of the Giants, Central Station, Pile Valley and Lake McKenzie. Don’t have a lot of time!? 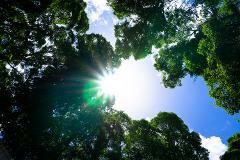 Or just want to do a short hike, well this is for you! Our Lake McKenzie Circuit 2 day hike allows you to see the best sights in just two days, including Lake McKenzie and Lake Wabby. 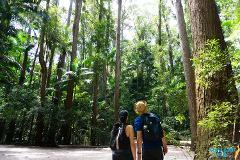 Spend 3days and 3nights exploring the best of the Fraser Island Great Walk trail, as you transcend through the lush tropical rainforest. Stay in luxury accommodation with gourmet meals! Have a real Fraser Island Eco Adventure and experience five (5) of Fraser Islands most beautiful pristine freshwater lakes on this, 3 day and 2 night, fully accommodated and supported pack free hike!